Why Is My Dog Being Sick? My dog has started vomitting and I’m worried. What should I do? A) Firstly, you should always get in touch with your nearest vet and seek immediate professional advice on an issue this serious. The dog vomits with ease, seemingly at will, and often without apparent cause. One thing that almost never causes a dog to vomit is eating too fast. Bolting food is the natural way for a dog. Eating too much, however, is another matter. The capacity of a p stomach to hold food is phenomenal. Life Magazine once ran a story about a five-pound puppy that ate a five-pound ham, all but the bone! Such examples, of course, are the ultra-extreme. Adult dogs, on the other hand, can hold only about one and one-half ounces of liquid for each pound the dog weighs. Some dogs may even hold as much as two ounces per pound of body weight, but any quantities above this almost always produce vomiting. 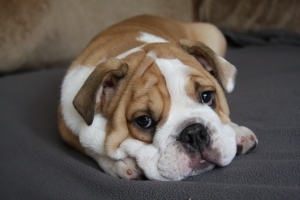 Vomiting, like diarrhea, is often seen in puppies. Dogs at this age have the exasperating habit of eating such things as dirt, stones, sand, bedding, toys, foil, paper, socks or almost anything else they can get into their mouths. Vomiting also occurs in adults from eating bones, sour food, garbage, carrion or feces. In these cases, vomiting is a sign of gastritis, which is an inflammation of the stomach. Gastritis is rapidly produced by such things as garbage, carrion or caustic chemicals. Most older dogs eventually learn that the foreign materials will make them sick, and stop eating them. The same dogs never seem to realize that garbage, buried bones or sour food may do the same thing – and neither do many owners! One of the most serious consequences of vomiting is that, once begun, vomiting can persist, even though the cause no longer exists. The usual course in such cases, if uncorrected, follows a characteristic pattern. The dog has a more or less violent seizure of vomiting that ordinarily eliminates the causative substance or object. The vomiting continues, but in a somewhat less violent nature, giving the appearance that the dog is improving. The loss of fluids and electrolytes in the vomiting causes an imbalance and a noticeable thirst develops. Mild depression develops as well as anorexia, and the vomiting begins to become more severe. Thirst is exaggerated, loss of fluids and electrolytes is accelerated and depression becomes marked. The vomiting becomes more and more violent and the continued loss of fluids and electrolytes creates a critical imbalance. If the situation is allowed to continue uninterrupted, the dog eventually dies from electrolyte imbalance and dehydration. To help with your dog’s vomiting problem, liquid foods should be fed first. Such things as beef and chicken broth not only supply a few calories, but are excellent tor establishing many of the electrolyte balances that have been disturbed by vomiting. Within 48 hours it is usually possible to finely chop a little hard-boiled egg into the broth. If this does not cause a return of the vomiting, then a little cottage cheese, some vanilla ice cream or a little toast and milk can be offered. Resumption of the regular diet can commence as soon as the bland foods are tolerated for at least 24 hours. Help! My Dog Has Canine Osteoarthritis, Should I Change His Diet?